Imagine travelling to your wedding destination wearing your wedding dress onboard a horse drawn carriage, over cobbled stones, down narrow lanes and past canals to meet your groom and say your vows in an ancient medieval building. 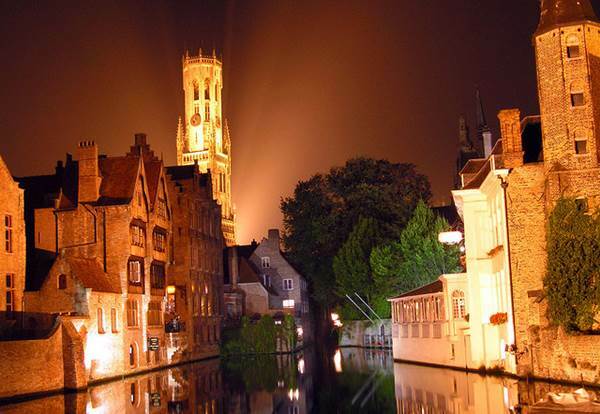 If you’re looking for the ideal, fairytale wedding destination then look no further than romantic Bruges. Often referred to as the “Venice of the North”, Bruges is full of charming canals, spectacular medieval architecture, cathedrals, windmills, chateaus and atmospheric narrow cobbled lanes making it the ideal location for a peaceful, quaint wedding. Bruges is an ideal location for romance because of its picturesque streets, and cosy quiet little pubs, cafes and restaurants. Nestled in a central location in the Belgian city is the aptly named Minnewater (The Lake of Love) where you can see swans serenely swimming on the water all throughout the year. The lovely swans of Bruges have a legend attached to them. The people of Bruges executed a town administrator, Pieter Lanchals, belonging to the court of Maximilian of Austria in the year 1488. In retaliation, Maximilian punished the population of Bruges by making it their obligation to keep swans on their lakes and canals forever as a swan was featured on the family coat of arms belonging to the executed administrator! The canals of Bruges are a lot cleaner than those found in Venice and weave throughout the city throwing reflections of the grandeur of the architecture into their still waters. The prominent medieval belfry sits in the centre of Bruges, if you climb the 366 steps you can look out over the whole city. The Long Canal (Rei), Bruges, Belgium. Looking towards the Jan Van Eyckplein. In the background is the Poorters Loge, a 14th century building with a slim tower. 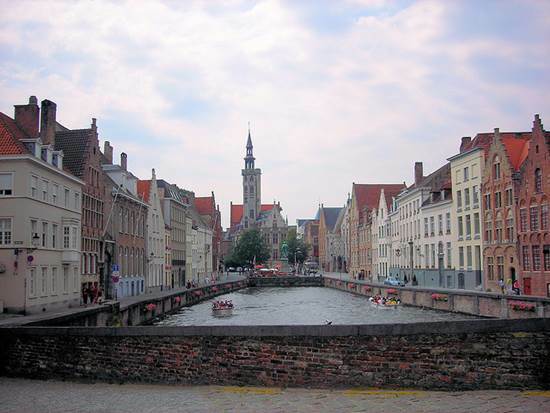 Bruges has become a more popular tourist destination since Colin Farrell’s 2008 movie ‘In Bruges’. 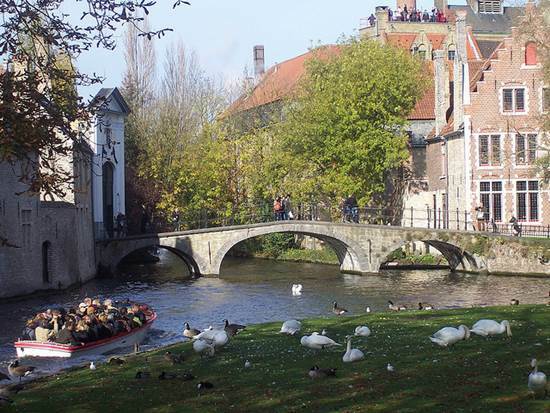 Bruges is beautiful all year round but it is now busiest during the summer and winter months when tourists come on their summer vacations or to visit the Christmas markets in winter. 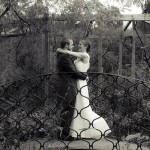 So perhaps the most peaceful time to get married in Bruges would be the spring or autumn months. 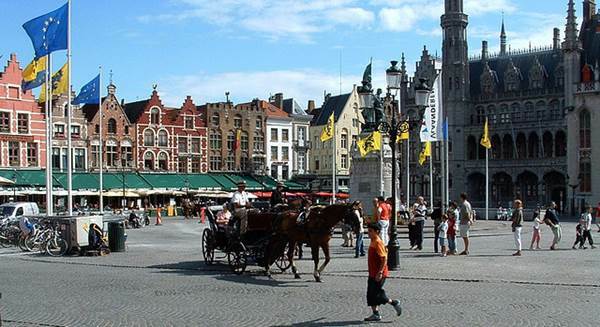 Visitors to Bruges can enjoy the city at their leisure either by bicycle, by canal boat or by horse drawn carriage. For the ultimate memorable romantic experience you could even take a champagne hot air balloon ride over the historic city at sunset. If you have your wedding in Bruges, it goes without saying that you’ll have these delecious Belgian Chocolates as wedding favors! 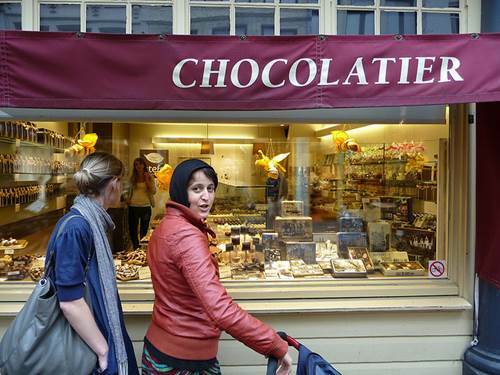 No wedding in Bruges would be complete without giving out Belgian chocolates as wedding favours and serving your guests a selection of some of the 350 renowned Belgian beers in branded glasses to celebrate. To have a civil marriage in Bruges either you or your partner must have been living in Bruges for at least 3 months (just one of the requirements). 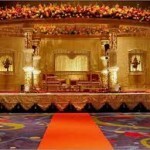 But if you get married in your own country it is possible to then have a ceremonial marriage wedding in Bruges. If you’re looking for a romantic fairytale city to tie the knot in, then Bruges ticks all the boxes. 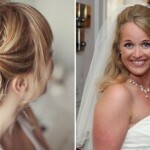 Sarah Hewitt is a new blogger who blogs about anything and everything. 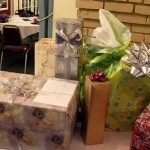 You can contact her via her Twitter page.